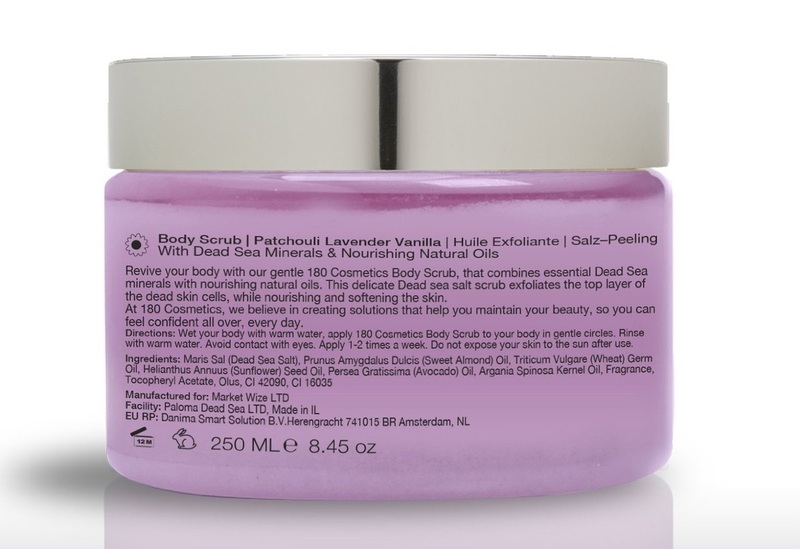 One of five fragrant body scrubs, combining Dead Sea Salt with different cocktails of essential oils and moisturising massage oils. I received a free sample of this product for evaluation and review and, given the choice, this is the one I would have picked for myself. The other combinations are very tempting as well, but I find the blend of lavender, patchouli and vanilla quite irresistible. All three essential oils have relaxing, mood lifting, anti-inflammatory and skin improving properties, boosted by the nourishing effect of sweet almond, wheat and avocado oils. Personally, I would prefer not to see any artificial colourings listed (blue and red colouring agents) but, hopefully, they are present in minimal quantities by the look of the scrub. 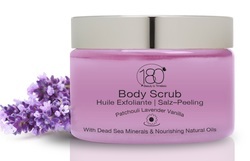 I love to use this product in the shower targeting problem areas such as elbows, knees and thighs but it is an excellent overall scrub that leaves my skin renewed and very soft. As a body-specific product, I do not use it on my face. The oily part of the scrub is minimal, the main body seems to be the salt and essences, so it does not make the shower floor too slippery and, as per instructions, it should to be used on damp skin. Apart from the delicious scent, I love how silky my skin feels after using this. Winter is hard on the skin and this type of product is an affordable luxury that makes me feel great. Similar in texture and in effectiveness to the Cellulite Reducing Solution by the same brand, this cream is designed to target any body area that could be firmer, smoother, less wrinkly (if your problem area is the chest, there is a more specific product called Breast Firming Solution). I accepted to test this cream for review purposes with more curiosity than high expectations because my target area is notoriously tough to improve. I had gained weight and then finally lost some, and was doing my best with exercise and my Slendertone belt, but as long as that little cushion of fat remained over my stomach, I could never see the full impact of my efforts. That's where this cream comes in. My stomach problem was not really cellulite but a different type of subcutaneous fat and very difficult to shift. I must stress that, good as the cream is, it takes time to see results. It will not magically melt away fatty bulges, it will not reduce your waistline measurement all by itself, and it does not claim to remove stretch marks, but it will improve the elasticity and tone of your skin. It can make all the difference when your shape is improving, but the skin texture lets you down. Loose, wrinkly skin is so ageing, as much on the body as it is on the face, but specialist creams like this one are difficult to find. I'm very glad I gave this a try because the improvement, once it starts to show, is very pleasing. The cream comes in a medium-sized soft tube (150 ml) and has a fairly thick consistency. It becomes very white as you spread it, and stays creamy for a while, allowing a good, long massage, which also helps. Once absorbed, there is no residue. Among the main active ingredients are caffeine, Vitamin C, carnitine, and algae extracts. It smells deliciously of essential oils and, like the rest of the 180 Cosmetics range, it is a natural product without any toxic chemical additives. All their products are also cruelty-free, and not tested on animals. So, if you have the patience and determination to address your imperfect skin, this product will be a great help, but it will be a very gradual process. Some improvement, however, is easy to see quite quickly. If your skin is at all lined, with surface creases and a general dry look, this cream will make an immediate impact that goes beyond just moisturizing. You will also get the uplifting, mood-improving benefits of massage, even though you are doing it yourself. The only negative I found is that the cap stopped closing after a couple of uses, so I decanted the tube contents into a jar. It seems to me that this cream would be very helpful during weight loss, even more than afterwards, as the skin would not a have a chance to become loose in the first place. 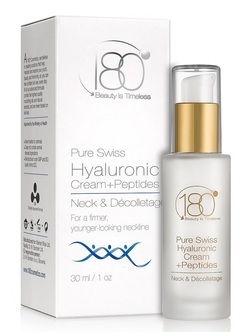 This cream was included in the “Younger You” bundle which was sent to me for an independent evaluation. I was already familiar with the serum, but was pleasantly surprised by the effectiveness of the cream. It is probably my favourite product from this brand. This lovely face cream (I'm not sure why the label says Neck and Décolletage, it's for the face as well) comes in a pretty frosted glass bottle with a pump-operated dispenser for precise application. The bottle contains 30 ml and I generally only needed four pumps to cover my face and neck. It is a thick, white lotion which penetrates well and leaves a mat surface, very suitable for use under make-up because there is no residual shine. It's not often I can say that, as my combination skin has a clearly oilier T-zone. I can even follow it up with a tinted primer without overdoing it. At night, I apply this over the serum, and then add a heavier cream on top. At 62, my skin needs that extra richness. Depending on your age, and the type of skin, you may find that this cream is all you need. What makes this different from other face creams is the very high concentration of Hyaluronic Acid (the essential ingredient in effective anti-ageing preparations) boosted by the addition of Vitamin C and Peptides. Activating the natural collagen in our skin cells is essential to retain moisture levels that make our skin look plump and fresh, as opposed to wrinkled and dried up. Even though we cannot totally erase lines and wrinkles, I believe that good skin care can slow down visible ageing and perhaps even reverse some of the more recent damage. Quite often by night-time, my face has acquired quite visible expression lines and this product seems to smooth away some of the traces of a long day. After my five-week test, using this cream twice a day as recommended, I am really pleased with the results. There is even a little bit left. The best part is that these products are effective but based on natural ingredients, hyaluronic acid and essential oils, all of which are well tolerated by my increasingly fragile skin. They are also cruelty-free and not tested on animals. 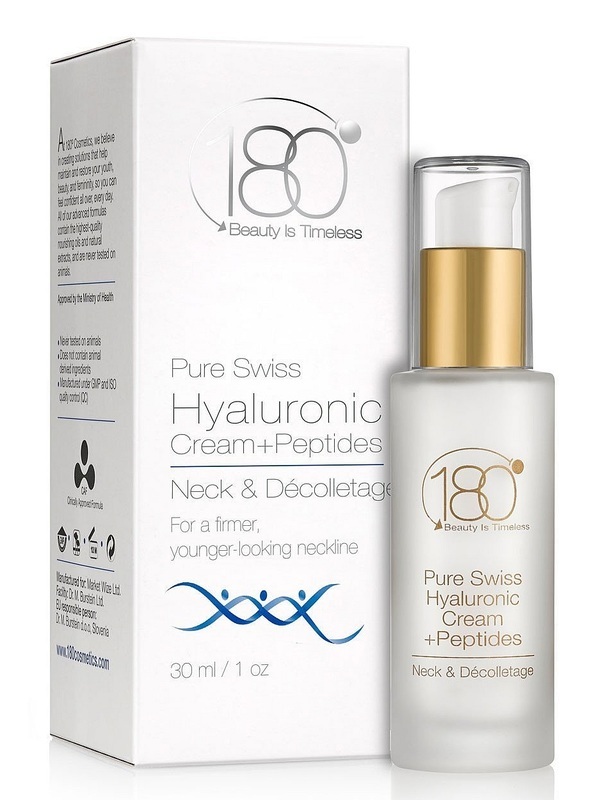 I was offered a sample of this product for an independent evaluation and, to properly observe any effects, I used this cream exclusively (in the target area) for the past four weeks or so. Since it is a specific treatment for the chest area (with the potential for undesirable effects), I paid particular attention to the list of ingredients before committing myself to a review. As far as I can see, they are mostly natural essential oils and vegetable oils with known moisturising, regenerative and soothing properties. To list just a few: extracts of rice bran, beetroot and tea leaves, apricot kernel oil, jojoba oil, shea butter, evening primrose oil, aloe vera, sea buckthorn (used for tissue regeneration), fennel oil, orange extract and mandarine peel oil. Like the rest of the 180 Cosmetics range, these products are not tested on animals, which is another thing I always look for in skin care. I was interested in this cream because my skin was showing the effects of a lot of suntanning and reduced firmness due to a recent weight loss. It took only a few applications for me to notice the principal and most obvious improvement, i.e. my skin started to look better, more toned and elastic. Light creases that had begun to develop smoothed out completely. I did not use the cream the recommended 60 days, so my results may not be conclusive, but I did not notice any increase in volume and, to be honest, was not expecting any. The soft, medium-sized tube (100 ml) lasted me just about a month although I did not always manage to follow the twice-daily directions. It is a dense, white cream with a pleasant, fresh scent of essential oils. Only a little is necessary each time and be prepared to spend at least five minutes massaging it in, because it becomes very white upon application and takes a little while to be absorbed. I think the circular massage is beneficial in itself in toning the skin. I am very pleased with the improvement in elasticity, hydration and tone and, given the ingredients, I would expect this cream to be suitable for all skin types, even sensitive and fragile like mine. As its name suggests, this thick white cream aims to reduce the visible impact of cellulite, that universally despised affliction of the vast majority of females past the age of puberty. I had mine relatively under control through a multi-prong approach involving diet, lifestyle, exercise and twice-daily application of an effective gel, when a freak accident put my left leg in a cast for six weeks. Naturally, as one might expect at my age (I'm 62), you cannot emerge from such a destructive event without some long-lasting consequences. In my case, my circulation was impacted and, with the forced inactivity, the dreaded cellulite returned. I'm back to doing all the healthy, active things I did before, but the cellulite has proved stubborn. I accepted to test this cream for review purposes and, to my delight, it looks like it's working! It has the requisite consistency as it stays creamy for a long time, long enough to allow a really thorough massage. I start spreading it by hand and then bring in the equipment: depending on how much time I have, I'll use my little ﻿TopNotch hand massager,﻿ or go for the gusto with my BBS Care ultrasound massager. As is evident from the very first whiff of this deliciously-scented cream, its formulation relies heavily on citrus essential oils (Orange, Grapefruit, Bitter Orange), together with other congestion-reducing plant-based extracts (Forskolin, Fennel, Coriander) and Carnitine (a protein compound involved in the transfer of fat through human tissue). As usual, I look for skin care that is not tested on animals, and which does not contain noxious chemicals. This cream does NOT contain: Formalin, Formaldehyde, Parabens, Phthalates, Petro-chemicals, GMO, Triclosan, colors or dyes. After only 11 days, I'm already seeing some improvement, and I love using it. It's early days but I noticed a visible firming up of my thighs, both front and back, and a general improvement in skin elasticity. I will update this review after the tube is finished to both comment on results and how long the tube lasted. I should mention that, unlike other creams I used in the past, I'm only applying this once a day. So far, loving it! 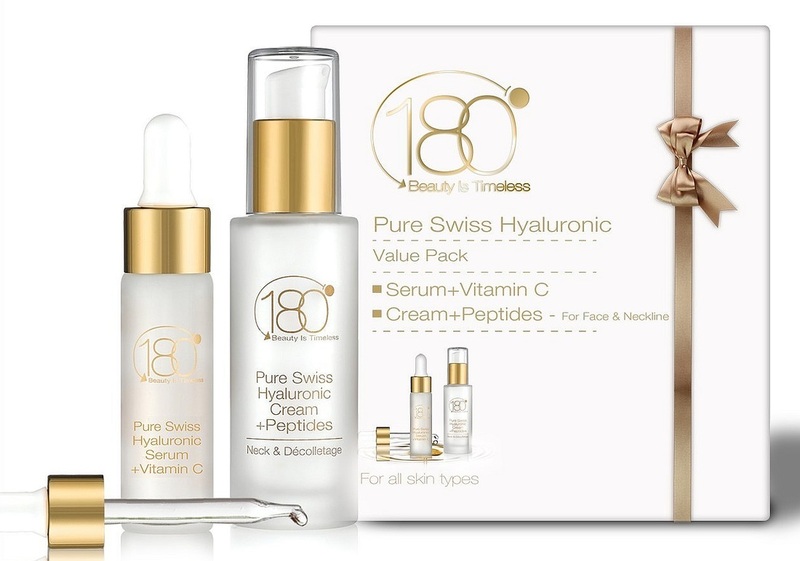 A sample of this product was sent to me for an independent evaluation and, as I normally do in such cases, I stopped using any similar products in order to give these two serums a fair test. In the Vitamin C Booster pack, there are two versions of this brand's Hyaluronic Acid serum, both enriched by the addition of Vitamin C. Activating the natural collagen in our skin cells is essential to retain moisture levels that make our skin look fresh and even. 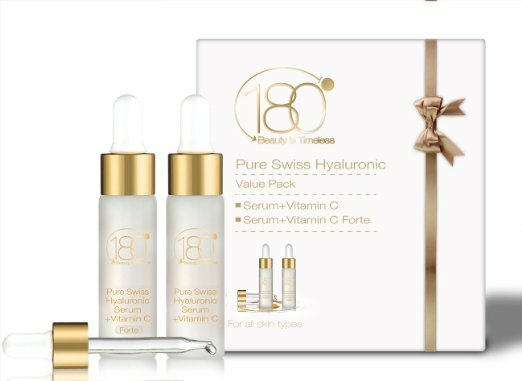 Hyaluronic Acid is the essential active ingredient I always look for in any skin care preparation and the Vitamin C is an added bonus as it addresses age spots as well as skin elasticity. Each frosted glass bottle contains 15 ml (a standard size for a serum) and has a convenient dropper dispenser for precise application. One serum is suitable for all types of skin, while the Forte formula is stronger and more concentrated and intended for the 40+ market. In my test period, I applied the classic serum in the morning and the Forte at night, when I tend to use heavier creams that need a little extra help to penetrate. I didn't notice any obvious difference between the two serums; both formulas suited my skin and did not cause any allergic reactions. The serums are both clear, watery liquids which disappeared into my face in record time with a short circular massage and made my skin absolutely drink the moisturizer I applied next. A good serum is intended to facilitate absorption of the cream that follows, and I found this to be true of both. At night I was able to layer two fairly rich creams after using the Forte. I really appreciated that, as my 62 year old face needs all the help it can get! I like everything about these products. They are not tested on animals, contain very few, very pure ingredients and none of the usual fillers, artificial perfumes and undesirable parabens. For me the combination of the two worked as well as the best serums I have used so far and lasted me over five weeks of twice-daily applications. As for price, I once paid three times as much for a big-name serum which did not impress me. I think this combo offers a lot of quality and very good value for money.